Sized specifically for women: narrower heel, tapered toe, and slightly more open cuff. EcoMerino Wool: From one farm that has been practicing environmentally sound techniques for hundreds of years. The wool is shrink resistant and dyed with non-toxic dyes. Ecopoly Recycled Polyester reinforcement: great moisture transfer, soft hand, and is incredibly durable. I've worn these in goretex-lined boot for low level walking and (higher energy) nordic walking in Spring conditions. Despite their light weight, the socks provided a good level of comfort all round my foot. 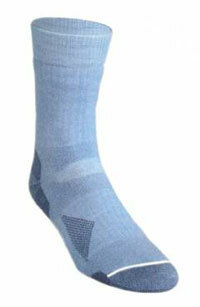 They didn't slip and the wicking is great so the risk of blisters is reduced significantly. They wash well, dry quickly and so far have not shrunk! I'm increasingly fond of wool socks particularly in hot weather. So I think these will be great for lower level walking particularly during Spring/Summer months. As they're wool, the odour masking is good - so if you're backpacking you may be able to get away with fewer pairs! The manufacturer emphasises the sustainability of all parts of the sourcing, manufacture and distribution processes. This may be another reason to consider the Teko range if this is important to you.